When it comes to greens I do play favorites and mine is Swiss chard…their multicolored leaves and stems makes me smile whenever I see them. (Although, my collard greens recipe is making me a very happy camper of late.) Alas, it is winter and the selection is slim for fun flavor combos…or so I thought. 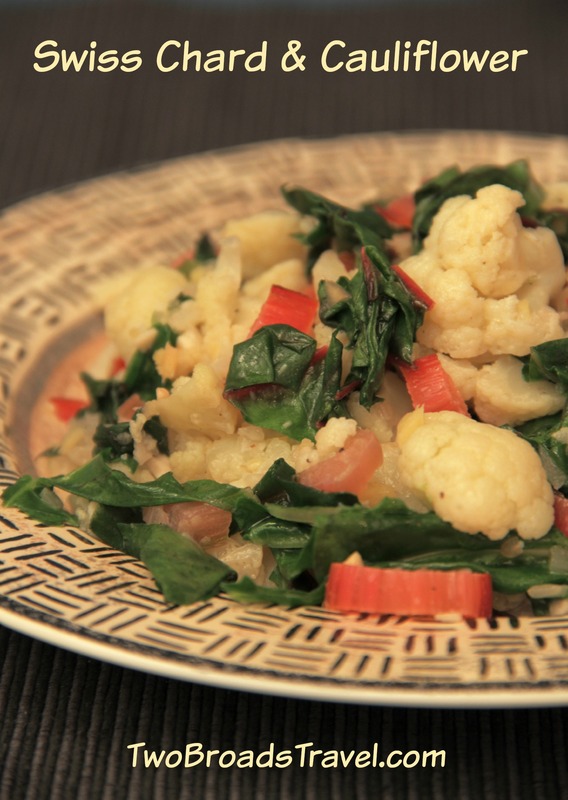 This spicy Swiss chard and cauliflower combo will compliment fish, fowl or your favorite noodle/rice with a burst of color and taste. Add garlic, chilis, onion, ginger to food processor and grind to a paste. Heat a large sauté pan, add splash of oil, heat, then add spice paste. Cook and stir. Don’t brown. Add cauliflower florets toss until coated. Add enough water to cover cauliflower florets. (I used one cup for my 12” pan.) Cook 3 minutes. Add fish sauce, lime juice and brown sugar. Cook until dissolved. Add Swiss chard and toss with mixture. Cook for about 2 minutes. Taste and adjust seasoning with fish sauce, salt and pepper. Disclosure: Cut ‘N Clean Greens sent the Swiss chard for recipe development. I threw out a swiss chard plants years ago and it survived and taken over my garden. I am always on the lookout for swiss chard recipes, so I am very excited about this one. Cathy, I think you’ll like this one. Thanks for stopping by. Cathy, you can use Swiss Chard whole leaves as wrappers, for of like you would do a lettuce cup. Just 1 idea. Judy, I’m with you I love the flavor combo here. I especially like the addition of the fish sauce. I will add this recipe to my vegetable repertoire. This is a magnificent recipe! The flavors…holy moly! Wow, does this ever look good! What a creative combination of ingredients and aromatics. Thank you for treating our Swiss Chard so very well. Coming from you that is a great compliment indeed, especially since you made the very best cauliflower I’ve ever tasted. Christina, sometimes great minds do think alike. I love Swiss chard.